Have you ever met a person for the first time and upon shaking hands experience a sort of electrical shock? Ever been inexplicably drawn to a particular person or animal? Energy is the chain that connects humans to the planet, heavens, animals, plants and other humans. By sharing the earth, energy is transferred through earth’s beings. Energy is the life force of all things. Water is energy. Water can exist in many different forms, which makes it the best conductor of energy. Water is quintessential to life. Without water, man surely will, for lack of a better word, wither. In the absence of water, plants die, animals perish and air becomes ‘unbreathable’. Water keeps the earth going. The earth has layers; lithosphere, asthenosphere, upper mantle, lower mantle, outer core and inner core. The inner core is also referred to as the solar plexus, the hot centre of the earth. These layers vary in energy frequencies. Just like the earth, humans also have layers. Layers whose energy levels also vary. The energy that surrounds a person is known as aura. Aura is a worldly womb. The strength of this aura is determined by the mind. One’s thoughts can affect and direct their energy. The earth’s energy field protects it from cosmic disasters and solar flares. By the same principle, a weak aura leaves room for unhappiness and attacks on self. Based on the energy running through a person, they can be completely attuned to the cosmos or in utter incongruence. All these frequencies travel up the body to congregate and project like a beam through the third eye. This is a spot between the eyebrows. What importance is this information to human beings? How does knowing about energy and aura beneficial to the human race? 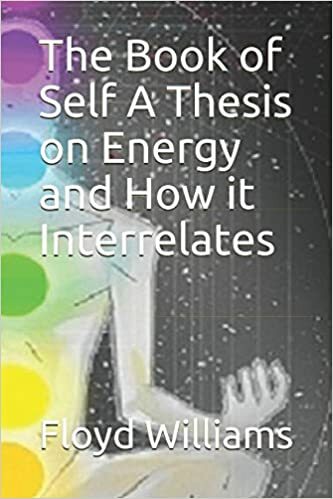 The Book of Self: A Thesis on Energy and How It Interrelates urges on the importance of following one’s intuition. Intuition is the natural Wi-Fi allowing communication between the mind and the universe to make accurate predictions. Floyd Williams also introduces the idea of sound and color being a language. The seven colors of the rainbow are ingrained in the threads of human psychological make-up. In his opinion, these colors should be integrated in everyday life as much as possible. The author reveals the secret to freeing one’s mind. A clear understanding of energy is essential in the quest to find true selves. A man’s true potential and power lies in their ability to let their mind run free and unencumbered. This book gives a prelude to this journey. The information in this book is a prerequisite in the study of life. This book uses easily understandable illustrations to unravel the answers to life’s questions. The author properly illustrates how to properly treat life as the gift it is. In Floyd’s terms, “Life is the gift, everything else is a blessing”. The reader’s relationship with self and the earth will be enhanced upon understanding the information in this book. Posted on December 13, 2017, in Book Reviews, Five Stars and tagged amazon, animal, atmosphere, author, book, book review, books, chakra, cosmos, earth, ebook, ebooks, energy, floyd williams, heaven, how it interrelates, human, intuition, journey, kindle, life, literature, meaning, non fiction, nonfiction, psychological, publishing, reading, review, reviews, self help, stories, study, the of self, thesis, third eye, water, wi-fi, wifi, writing. Bookmark the permalink. Leave a comment.